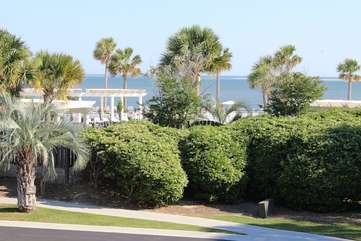 Have you been looking for the perfect vacation villa for your Seabrook holiday? Well, we think we have found it! 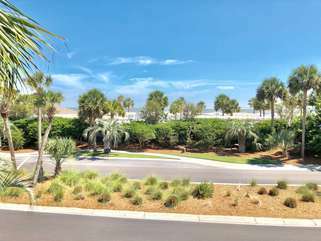 2935 Atrium offers panoramic views of the Atlantic Ocean and a premier location close to many of Seabrook's amazing amenities. 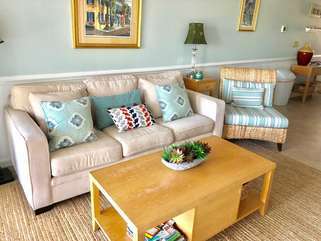 This villa has been updated and has lovely furnishings and features. 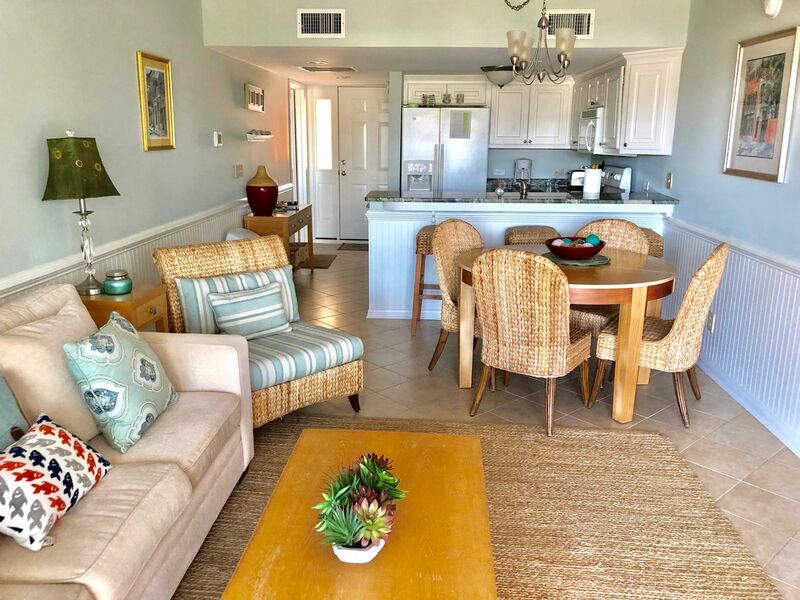 With two bedrooms (with 2 queen beds in each), two en suite baths, and a convenient location, it is perfect for families, couples, golf buddies, wedding guests, and tennis foursome looking to enjoy the Seabrook lifestyle. 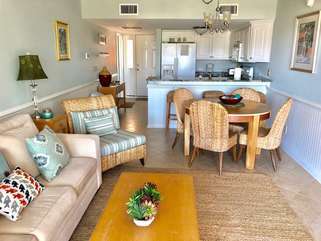 Upon entering, you will notice the new tile flooring, soothing color palette, and ocean views. The updated kitchen features white cabinetry and granite countertops, white appliances, and well stocked cabinets. The living/dining area of this villa has comfortable seating, a large HDTV/DVD/stereo, and sliding doors leading to the huge covered patio overlooking the ocean and Beach Club pools. The dining table seats 4. There is additional seating for 3 at the kitchen bar. Read on the chaise lounge chairs or enjoy cool drinks around the table on the tiled deck while listening to the ocean waves. This villa has two large bedrooms. The master bedroom has two queen beds and an en suite bath with a shower. 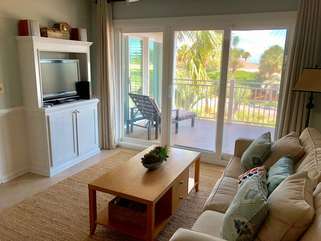 There is a TV and access to the porch with ocean views. The 2nd bedroom also has two queen beds, TV, an attached bath with a tub/shower, and offers a magnificent view. The location of this villa cannot be beat. Catch the sun's rays at Beach Club pools just across the street. 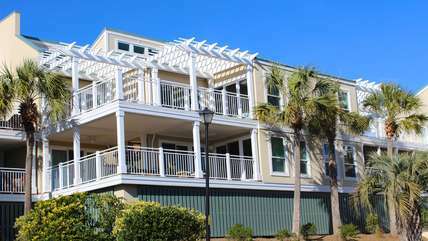 Take an early morning walk on the beach or watch the sunset over the Edisto in the evening. Dine, play, and shop at Pelican's Nest restaurant/bar, Island House, arcade, or Seabrook Shoppe. Interested in golf? You can walk there too! Seabrook's two championship courses, Ocean Winds and Crooked Oaks, are steps away. 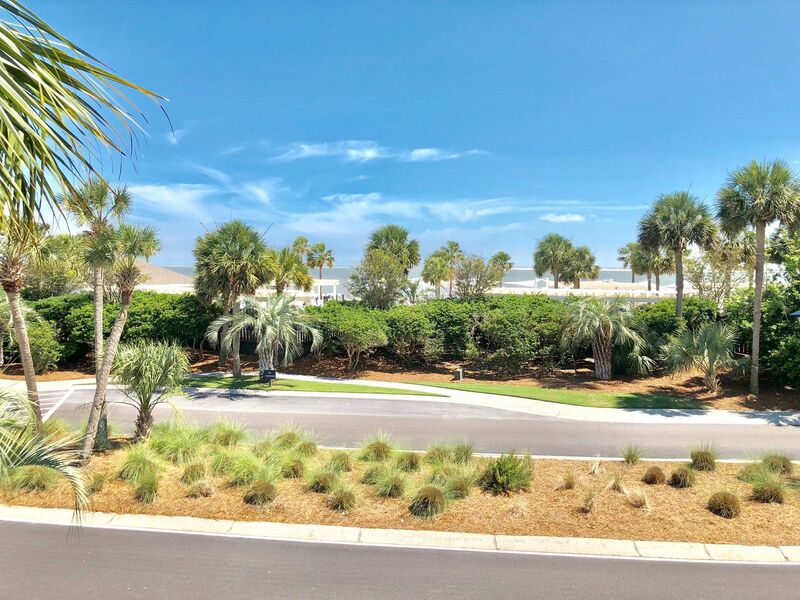 Amenity cards giving you access to the Seabrook Island Club's facilities: outdoor, oceanfront pools (seasonal), Pelican's Nest outdoor, oceanfront restaurant/bar (seasonal), Island House restaurants/bar, golf, tennis and Lake House indoor/outdoor pools and fitness center, are included in the rent. Additional fees are charged for all activities except outdoor pool usage. This villa has it all! 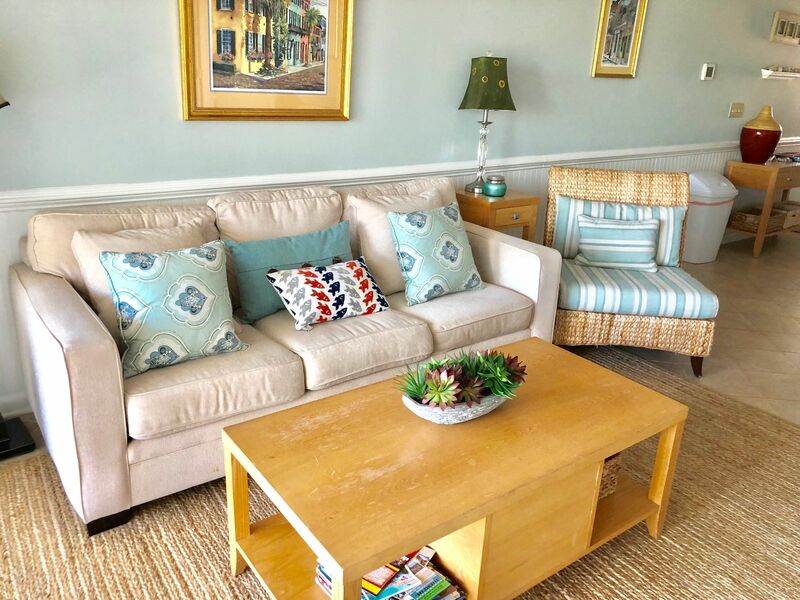 Location, beautiful beachy decor, ocean views! 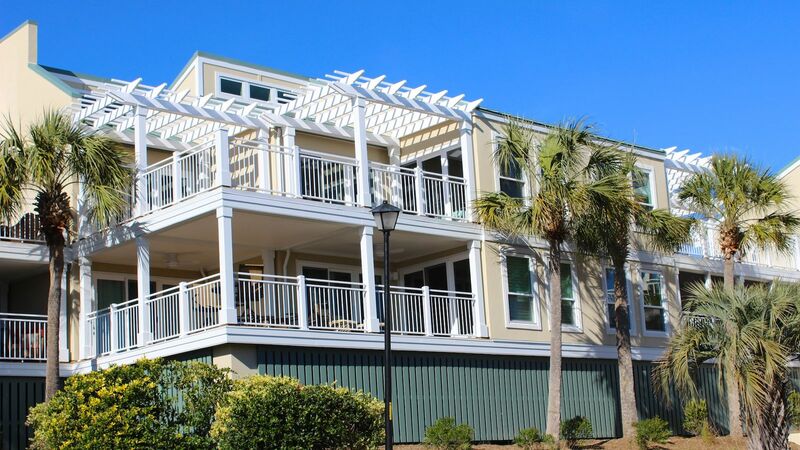 We invite you to come to 2935 Atrium and see how wonderful your Seabrook vacation can be!